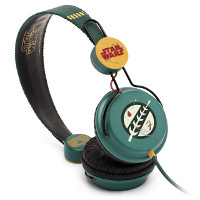 So we’ve looked at Darth Vader drop some serious beats yesterday, and here is Boba Fett who intends to have his own 15 minutes of fame with the Star Wars Boba Fett Headphones. Currently available for pre-order, it is tipped to ship from February 2nd onwards (which isn’t too far away – just 2 days, to be exact) for a highly affordable £34.99. For any serious Star Wars fan, that can be considered to be a bargain. Wearing this will help you capture the look of the Galaxy’s favorite bounty hunter, where it will sport an adjustable strap which is capable of fitting most head sizes, while a 1.2 meter coiled cord should be adequate for most listeners. This is an officially licensed product that would definitely have serious collectors sit up and take notice, although we’re sure you can get comparable performance from cheaper non-branded headphones.